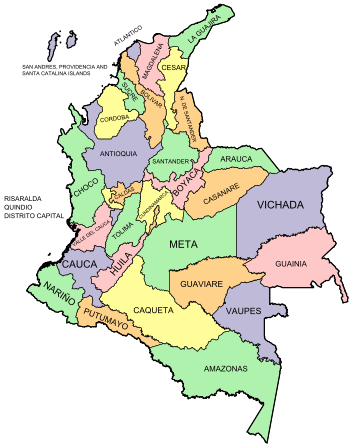 Colombie is an unitary republic formed bi thirty-twa depairtments (Spainyie: departamentos, sing. departamento) an a Caipital Destrict (Distrito Capital). Each depairtment haes a Govrenor (gobernador) an a Depairtment Assembly (Asamblea Departamental), electit bi popular vote for a fower-year period. The govrenor canna be re-electit in consecutive periods. Depairtments are kintra subdiveesions an are grantit a certain degree o autonomy. Depairtments are formed bi a groupin o municipalities (municipios, sing. municipio). Municipal govrenment is heidit bi mayor (alcalde) an admeenistered bi a Municipal Cooncil (concejo municipal), baith o which are electit for fower-year periods. The Caipital Destrict is the kintra's caipital, Bogotá. Bogotá is partially dependent on the Cundinamarca Depairtment that surroonds it. Each ane o the depairtments o Colombie in the cairt belaw airts tae a correspondin airticle. * Estimate includes the kintra's caipital, Bogotá. Map o the Depairtments o Colombie wi Municipalities. Map o Depairtments o Colombie wi names owerlaid. This page wis last eeditit on 27 November 2014, at 02:15.